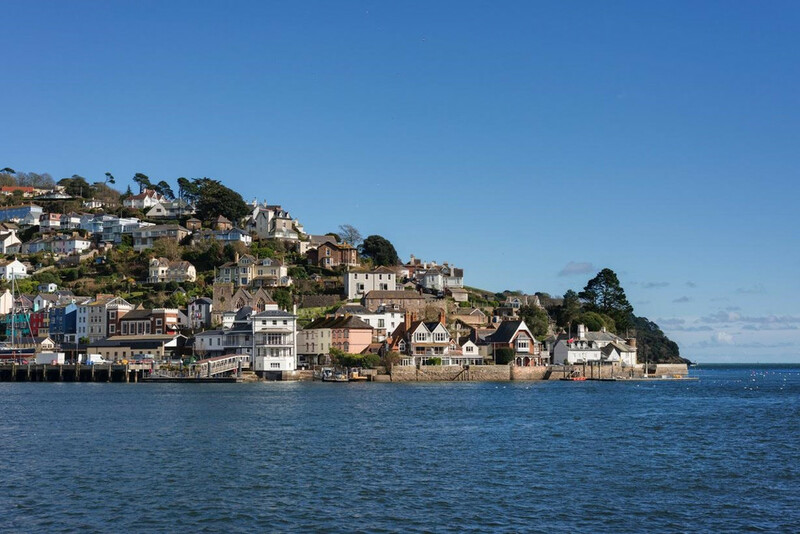 Part of an iconic landmark building right on the waterfront in picturesque Kingswear village is the former Royal Dart Hotel, now restored to its former glory providing a stunning three bed contemporary designed house retaining many period features. 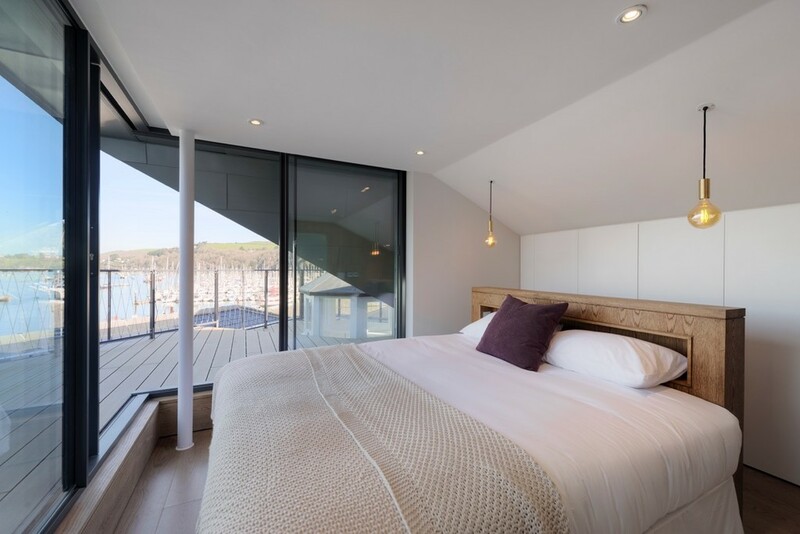 Designed by Gillespie Yunnie Architects with construction by Moor Manage, this property comprises a master bedroom complete with wet room and stunning roof top terrace overlooking the River Dart, Britannia Royal Naval College and Dartmouth town. 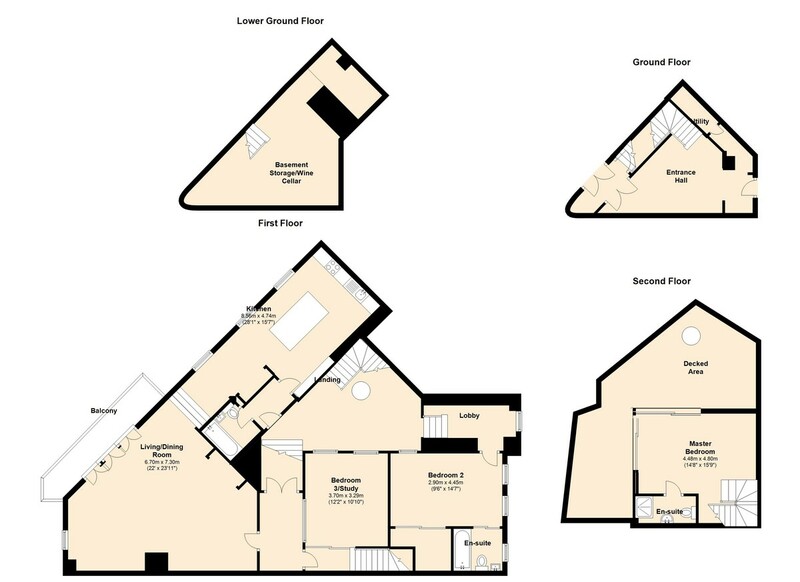 A guest suite and further versatile room could provide a third bedroom or additional reception room. 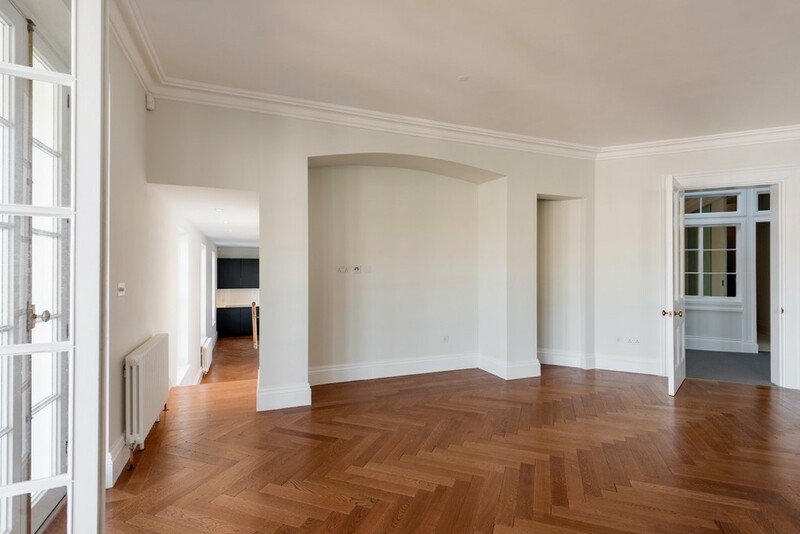 The large sitting room with tumbled oak parquet floors and grand tiled entrance hall with sweeping staircase provide an elegant setting in which to live, work or play whilst enjoying the comings and goings on the river from your balcony. Impress your guests with tales of the bygone days when distinguished visitors such as Queen Victoria's youngest daughter, Princess Beatrice, or even the exiled Emperor Napoleon III arrived by steam. RECEPTION HALL Front terrace provides access to your own private entrance which opens into a breath-taking RECEPTION HALL with wood panelling and dado rail, feature pendant light fitting, traditional column style radiators, stunning period style tiled floor and grand sweeping carpeted staircase with magnificent oak handrail. UTILITY ROOM UTILITY which houses the hot water cylinder, boiler and washer dryer. Tiled floor and spotlights. In the RECEPTION HALL part glazed double doors open to an INNER HALL with part glazed double doors out to the rear of the building. Door opens to steps leading down to a large BASEMENT ideal to use as additional storage, wine cellar or gym. The original sweeping staircase is accented with a beautiful contemporary pendant light fitting. Further light is brought into the whole space through three sash windows, all fitted with acoustic glass to minimise any noise penetration, and a lantern cupola light well. HALLWAY with feature internal original windows to BED 3/RECEPTION 2. The retained original Royal Dart Hotel part glazed doors open to an inner HALL off which the main SITTING ROOM is accessed as well as BED 3/RECEPTION 2 with bespoke oak stairs upto the MASTER SUITE. Carpet, radiators and arched opening off the HALL lead to KITCHEN and BATHROOM. 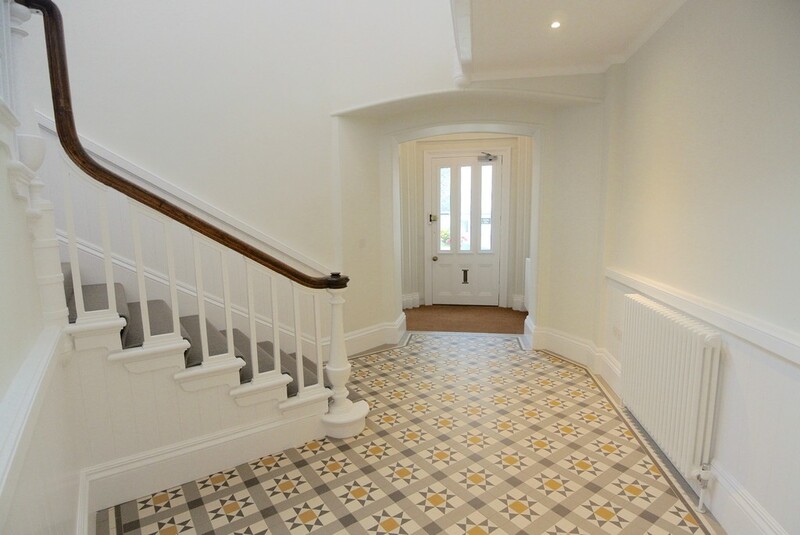 From the main LANDING stairs lead to the historic clock tower with pendant light fitting and sash window affording village and woodland views. Now a GUEST SUITE comprising good sized double bedroom with bespoke fitted wardrobes with white lacquered exterior and oak interior finish with integral lighting. Two arched sash windows fitted with acoustic glass provide pretty views over the village. Slimline radiator, carpet and internal window to the grand HALLWAY. Sliding door opens to a fully tiled SHOWER ROOM complete with large walk-in shower with glazed shower screen, wash hand basin, inset w.c., mirrored wall cupboards with ambient lighting under, extractor fan, shaver point, sash window, heated towel rail and underfloor heating. SITTING ROOM 21' 11" x 23' 11" (6.7m x 7.3m) SITTING ROOM with high ceiling and coving this room benefits from a beautiful tumbled oak floor. 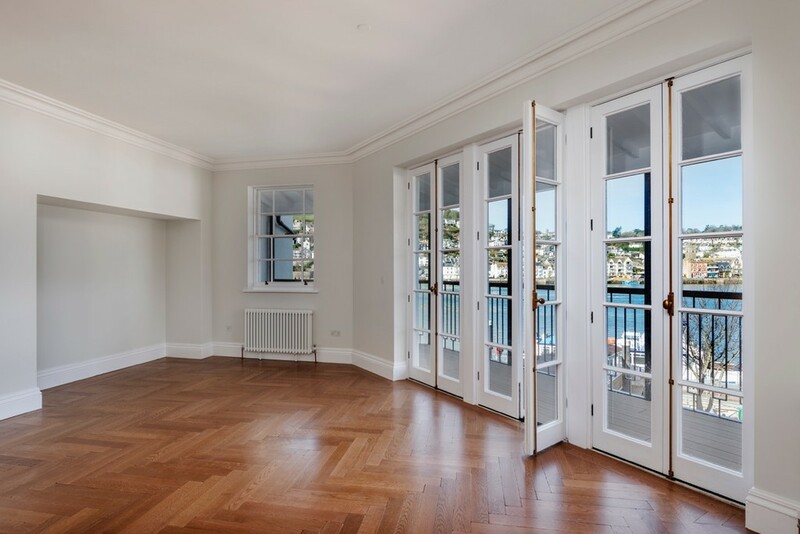 Three sets of original restored double doors, fitted with acoustic glass, open out onto a superb covered balcony with glorious close River Dart views. Sit and watch the world and his boat go by on the river or the hustle and bustle of Dartmouth town, as well as the Britannia Royal Naval College. Sash window, radiators and TV aerial and telephone sockets. KITCHEN 28' 1" x 15' 7" (8.56m x 4.75m) Oak steps lead down to the bespoke fitted KITCHEN with SMEG appliances, a breakfast bar and counter with prep fridge and plenty of soft close drawer space and three designer pendant lights over. 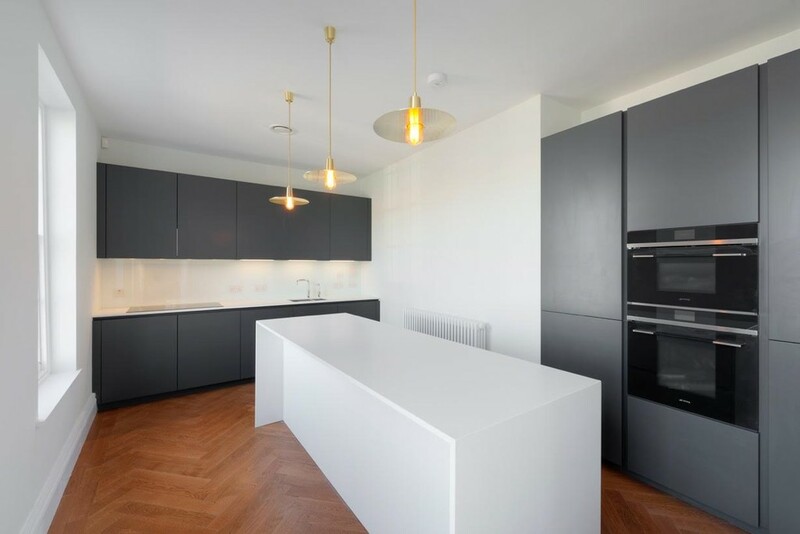 The double oven and fridge/freezer are integrated into the wall behind with a 1½ bowl stainless steel sink and induction hob with concealed extractor fan over, and instant boiling water tap set in a white quartz work surface with white lacquer wall and base units complementing the black lacquer finish on the other side. Glass splashbacks and three large sash windows ensure this is a light and airy space. Door opens to LANDING with further door to: BATHROOM comprising fully tiled walls and floor with underfloor heating. Heated towel rail, spotlights, extractor fan, shaver point and inset w.c.. Full bath with shower over, plus hand held shower, and glazed shower screen. Wash hand basin with mirrored cupboards above complete with lighting underneath and oak interior finish. BEDROOM/STUDY 12' 2" x 10' 10" (3.71m x 3.3m) BED 3/RECEPTION 2 is a versatile space with original internal windows from the Hotel looking over the HALL and through to the steam railway where the bellboy would look out for the steam ready to go down to carry the bags of the distinguished visitors. With sliding door separating this space it would suit as a TV/FAMILY ROOM or additional BEDROOM. Carpet, spotlights, radiator, high ceiling with coving, TV aerial and telephone points. 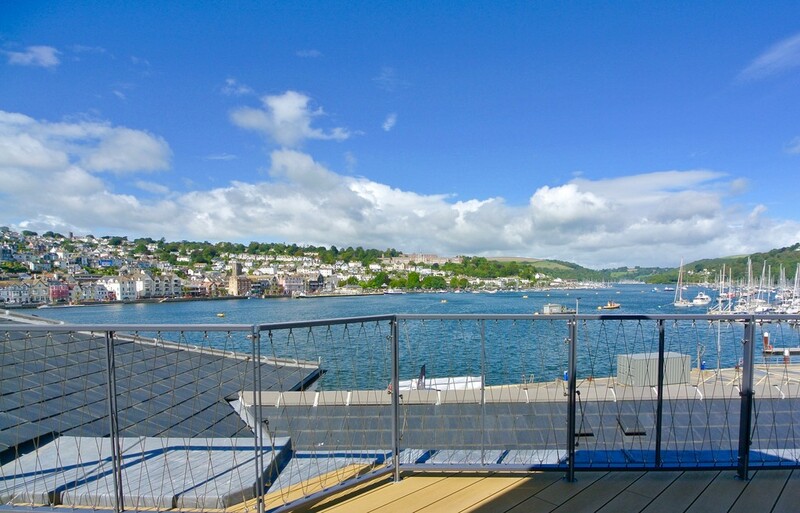 MASTER BEDROOM 14' 8" x 15' 9" (4.47m x 4.8m) The MASTER BEDROOM SUITE is accessed via a private oak staircase which opens to a stunning vista of the River Dart. With two glazed walls and sliding doors which draw back to let the outside in, you can walk out onto a large private deck to take in all the spectacular water views. Oak flooring and headboard with pendant light fitting, two bespoke fitted wardrobes with white lacquer finish and oak interior and integral lighting. The ENSUITE wet room comprising fully tiled walls and floor with underfloor heating, rain shower, heated towel rail, spotlights, mirror over wash hand basin and inset w.c. is separated from the main room with a beautiful etched glass screen. All of this makes for a luxurious and relaxing retreat over the water. 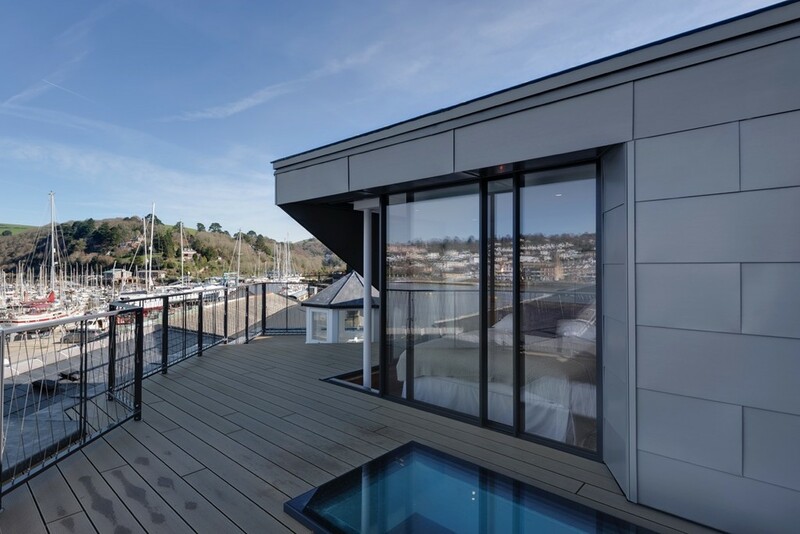 The ROOF TERRACE has a walk on skylight, contemporary designed balustrades and superb panoramic views of the river, marina and surrounding countryside. TENURE: Leasehold with share of freehold. Vendors to advise approximate service charges. Length of lease TBA. Grade II listed building. Please note The Royal Dart building complex comprises one three bed house, three two bed apartments, one two bed townhouse, large storage area and a commercial unit.